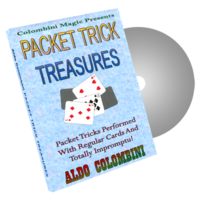 Today, when you order "Packet Trick Treasures by Wild- Colombini Magic - DVD", you'll instantly be emailed a Penguin Magic gift certificate. You can spend it on anything you like at Penguin, just like cash. Just complete your order as normal, and within seconds you'll get an email with your gift certificate. 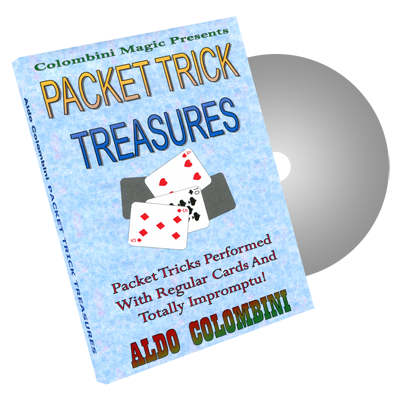 Here's another collection of packet tricks. Using only a few cards you can perform very strong, baffling, visual magic. The main feature is: TOTALLY IMPROMPTU EFFECTS AND NO SET-UPS! COURTSHIP (Nick Trost): You show two separate packets of cards, four Queens and four Kings. Magically they assemble by colors and suits! NINE FOREVER (Aldo Colombini): A two-phase routine using just eight cards including a card revelation and a prediction! GORDON'S ACES (Paul Gordon): Eight cards are removed and you try to find a card of each suit. You do, but at the same time, you also find the four Aces! DECA OIL & WATER (Max Maven): The name says it. An oil and water routine using ten cards. Very strong effect! NICE SALAD (Aldo Colombini): One of my favorite packet tricks. Four red and four black cards: They change places, they separate and then they mix! You'll never stop performing this routine! FREE WILL (Peter Duffie): A spectator freely picks four cards among eight and he leaves you with the four Aces. No sleights! DESPERADO (Aldo Colombini): You show four Jokers and a card is selected. Two of the Jokers change into mates of the card and the other mate appears between the two remaining Jokers! ALIKELY STORY (J.K. Hartman): One of the best 'Universal Card' routines ever, where a card takes the identity of three other cards with an extra surprising finish! ROYAL MIND READING (Karl Fulves): Two Royal Flushes are used to reveal two freely selected cards! FLING (Aldo Colombini): The twelve face cards are used to produce a series of bewildering coincidences, where at the end all the cards match!